Once in a while, change is good. TriMet’s proposed 2012 cuts, presented in open houses last month and subject to a series of public hearings this month, are full of bad news: dramatic fare hikes, longer waits, the end of the Free Rail Zone. But what you haven’t heard is that a few of the changes will be great. That’s why we’re excited to publish this guest post from Zef Wagner. Zef, a contributor to Portland Transport, is turning his serious yen for transit service design into a master’s in planning at Portland State University. As part of his ongoing project at Portland Transport to document the changes, he’s found three – one in Southwest Portland, one in the northwest and one on the inner east side – that we think will actually be great for riders. Anyone who regularly uses transit in Southeast Portland has probably noticed the large gap between north-south crosstown bus lines. Between the 6 on MLK/Grand and the 75 on Chavez Boulevard, there are no buses that connect the inner SE with neighborhoods like Alberta or Concordia. The result is that a transit trip from inner Hawthorne to the heart of Alberta usually takes at least an hour, with one or two transfers and at least 15 minutes spent waiting at stops. For transit riders, two of Portland’s most active and densely populated neighborhoods are effectively cut off from one another. 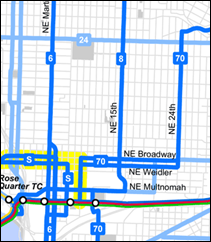 TriMet’s proposal to merge the 70 with either the 9 or the 73 will create a badly-needed new crosstown route that fixes this. By merging the 70 with the 9 or the 73, the same trip would only take about 35 minutes, with no transfers. It’ll connect neighborhoods to each other and connect people with jobs and services in a whole new way, and that should be applauded. One great thing visitors notice about Portland is how clear and comprehensible much of our transit system is compared to other cities. 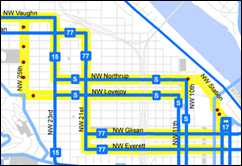 The grid network of bus lines found in much of North, Northeast and Southeast Portland is simple and easy to understand because most streets have a single bus line running along it rather than a confusing tangle of routes going off in different directions. The grid breaks down in areas like Southwest Portland and Washington County, where geography conspires to force many bus routes on the same winding streets. But In Northwest, we have a curious case where there is a clear grid of streets, but also a confusing tangle of bus routes. The 77, in particular, has complicated route that makes several unnecessary turns, duplicates the Streetcar on Northrup/Lovejoy, and oddly runs one way on 23rd and 25th even though 23rd is a two-way street. By moving the 77 to run on 21st and Everett/Glisan, Northwest Portland will finally have a clear grid structure that anyone can intuitively understand. Much like the changes proposed for Northwest Portland, the changes in Beaverton are an attempt to streamline service into a more grid-like pattern. 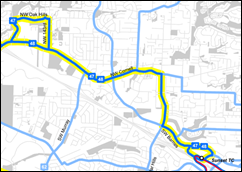 Today, the 47 and 48 connect Hillsboro Transit Center to Tanasbourne, but then cut down to Willow Creek Transit Center, while the 89 connects Tanasboune with Sunset Transit Center. TriMet is proposing to simply eliminate the 89 and replace it with an extension of the 47/48, creating a more or less direct east-west route all along the Sunset Highway corridor. The 48 will also add Sunday service, and the segment currently served by the 89 will see a substantial boost in service hours. Overall, these changes will make it easier for transit riders to access more destinations on a single ride, while still allowing connections to MAX at either end. Post by zef at 2:17 pm March 3rd, 2012. Like what you see? Get future posts by email.